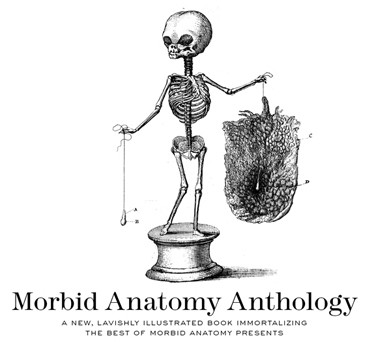 Morbid Anatomy Presents This Week and Beyond at Observatory: Morbid Anatomy Anthology publication fundraising party with mini-lectures, cocktails, giveaways, screenings, music and delightful co-editor Colin Dickey! Thematic Halloween edition of our popular Anthropomorphic Insect Shadowbox class! Sugar Skull workshop! Observatory annual Day of the Dead Party! Hope to see you at one or more of these great events. The Morbid Anatomy Anthology will cover such topics as anthropodermic bibliopegy (ie. books bound in human skin), 19th Century "Diableries", Henry Wellcome's collections of preserved human tattoos, 19th century death-themed Parisian cabarets, extreme taxidermy, popular wax anatomical models, collecting death, the Anatomical Venus, Santa Muerte and Death in Mexico, "artist of death" Frederik Ruysch, macabre collections, and much, much, MUCH more. The rogue scholars, artists, writers, museologists, morticians and scientists whose works fill this volume will include Morbid Anatomy Library Scholar in Residence and star of TV's "Oddities" Evan Michelson; Mark Dery, cultural critic and author of the upcoming The Doubtful Guest: The Mysterious Mind and Legendary Life of Edward Gorey; Paul Koudounaris, author/photographer of Empire of Death; Stephen Asma, author of Stuffed Animals and Pickled Heads; Caitlin Doherty of Order of the Good Death; Carl Schoonover, author of Portraits of the Mind; Mel Gordon, author of The Grand Guingol; Kate Forde, curator at The Wellcome Collection; Pat Morris, author of Walter Potter and His Museum of Curious Taxidermy; Ronni Thomas, creator of The Midnight Archive; John Troyer, deputy director of the Centre for Death and Society at the University of Bath; Artist Zoe Bellof; Photographer Shannon Taggart; Mark Pilkington of Strange Attractor Press; Ross MacFarlane of The Welcome Library; Joanna Ebenstein of Morbid Anatomy; writer Colin Dickey; and many, many more. Today, join former AMNH Senior Insect Preparator Daisy Tainton for a special Halloween-themed edition of Observatory's popular Anthropomorphic Insect Shadowbox Workshop. In this class, students will work with Rhinoceros beetles: nature's tiny giants. Each student will learn to make--and leave with their own!--shadowbox dioramas featuring carefully positioned beetles doing nearly anything you can imagine. Beetles and shadowboxes are provided, and an assortment of miniature furniture, foods, and other props will be available to decorate your habitat. Students need bring nothing, though are encouraged to bring along dollhouse props if they have a particular vision for their final piece; 1:12 scale work best. Mexico possesses a rich and complex relationship with death that extends far beyond the Day of the Dead holiday and its iconic sugar skulls. Indeed, from Mexico's indigenous Mayans through her occupations and revolutions, death has taken a leading role in the formation of the country's varied culture, causing scholar Claudio Lomnitz to even name Death as the symbol of Mexico's national identity. The lecture portion of this workshop seeks to facilitate a deeper understanding not only of Southern Mexico's sugar skulls and El Dia de los Muertos as a whole, but also framing what is often thought of as the Mexican version of Halloween within the greater context of a culture that has blended indigenous practices, colonization's Catholic religion, and the subsequent revolutions and violence, recognizing death as a necessary part of life not to be ignored or feared, but embraced and celebrated. For this workshop, each attendee will be provided with a blank, undecorated sugar skull, fully assembled, dried, and ready to decorate. Royal icing in bright colors as well as other traditional decorative materials such as sequins and colored foils will be provided. Each attendee is encouraged to bring any personal decorating items they wish to use if they are making a skull for a specific departed individual, though smaller items are recommended. Traditional themes and patterns will be discussed, as well as decoration application techniques. At the end of the workshop, each person will have their own large sugar skull to take home. Because of the drying time involved with the royal icing, it is advised that skulls be left at Observatory to dry and set, and that finished skulls be picked up at the annual El Dia de los Muertos party. Extra blank skulls will be available for purchase for those interested, as well as directions for making the royal icing recipe that is recommended for skull decoration. Annual Observatory Day of the Dead and Halloween Costume PartyMusic, Performance, Costumes, Tequila, Traditional Altar, Sugar Skulls, Death Piñata, and tacos provided by our favorite local taqueria Oaxaca! Please join us on Saturday, November 3 for the annual Observatory Halloween/Day of the Dead costume party! This year we will welcome back the ghosts of the dead in the tradition of our favorite holiday--the Mexican Dia de los Muertos or Day of the Dead--with Aztec dances and chants, traditional foods and drink, tacos catered by local favorite taqueria Oaxaca, episodes of The Midnight Archive, tequila, music, sugar skulls, our beloved La Catrina, a Day of the Dead Altar honoring the late Chavela Vargas and Neil Armstrong and, as always, an opportunity to strike a mortal blow to our beautiful piñata of Lady Death herself! There will also be, as always, the opportunity to don--and admire other!--amazing Day of the Dead-themed costumes. Event will be catered by local favorite taqueria Oaxaca! TRADITIONAL DAY OF THE DEAD ATTRACTIONS! Day of the Dead Altar honoring the late Chavela Vargas and Neil Armstrong. Piñata: Dash death to smithereens with our annual death piñata! Offerings to the Departed: In some places in Mexico, people leave small, coffin-like figures out for the souls of the departed. Guests are invited to leave their own offering; they will be available at the installation. For photos from last years' party, click here. Hope very much to see you there. November 19: From the Akashic Jukebox: Magic and Music in Britain, 1888-1978: Illustrated Lecture and Rare British Occult Recordings with Mark Pilkington of Strange Attractor Press. You can get a full list of upcoming events by clicking here.